Maestro Timothy Hankewich, in fine fettle, hosted the varied and festive Holiday Spectacular on Dec. 20 in the afternoon at the Paramount Theatre. Orchestra Iowa was joined by Chorale Midwest, the Espressivo Strings of the Preucil School of Music, the children’s Discovery Chorus, the Carillonneurs Handbell Ensemble, Neal Marple on the Mighty Wurlitzer, and five “Paramount Rockettes.” Together, they delivered a show that ranged from classical to kitschy. Orchestra Iowa and Chorale Midwest – both separately and together – were wonderful throughout the concert. Whether performing upbeat, well-known Christmas standards or more classical repertoire, both ensembles gave strong performances. The Carillonneurs Handbell Ensemble, positioned in the balcony, was difficult to hear from my seat on the main floor. The Mighty Wurlitzer, on the other hand, was a significant presence, particularly at the close of the first half of the show, when the singers-both younger and older-had to truly belt out “Joy to the World” to compete with the organ and orchestra. Marple entertained the crowd during intermission, performing several carols on the organ. The “Paramount Rockettes” seemed a bit unsure of Alisabeth von Presley’s choreography, and a bit tentative even when they knew the steps. The program lists six dancers, but only five appeared on stage, which may have accounted for some of the uncertainty. True to their borrowed name, they executed a kick line on Hankewich’s own “Ol’ Saint Nick (Kickin’ Kringle),” much to the audience’s delight. Hankewich is the perfect holiday host, taking obvious joy in the music and inviting the audience to do the same. He does much more than simply keep time on the podium, often employing his whole body to highlight a musical moment. 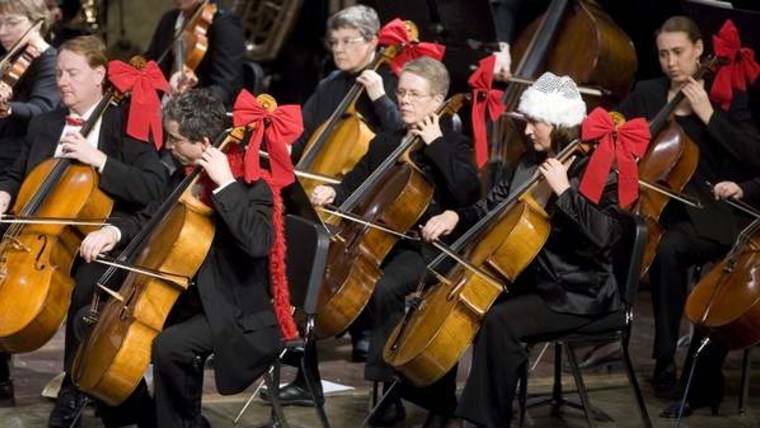 His spirit is the bow atop a generous holiday gift of music.